Paul Leon Winkel was born August 30, 1933, the youngest of 8 sons of Peter K Winkel and Anna Belle (Piersch) Winkel at a farm north of Glen Elder. He departed this life suddenly and unexpectedly at Via Christi St Francis Hospital in Wichita as a result of a brain injury sustained in a fall. Paul’s father died when Paul was only 13 months old and thus, he looked to his older brother Ralph as a father figure. Paul was extremely close to his mother, admiring her strength and courage in raising 8 boys by herself during some very difficult times. As a young boy, you could often find Paul and his older brothers fishing or ice skating at the creek or riding horses. He had fond memories of time spent with the neighbor kids, including Winkel relatives, along with the Eberle, Fox, Moyer, Shoemaker, and Timbers clans. Paul reminisced of the fun the boys had creating and shooting “rubber band” guns from the forts they built. Following high school graduation, Paul went to Utah to work, but returned to Glen Elder soon thereafter as he was homesick. He started working for the Glen Elder Livestock when it was located south of Tipton and also ran the motor grader for Glen Elder Township for many years. On Saturday’s, Paul often attended wedding dances in Tipton which is where he met Dorothy Streit. He finally drummed up the courage to ask her to dance on the last dance of the evening. They were married on Tuesday, October 4, 1955, at St. Boniface Catholic Church in Tipton. Paul had very neat penmanship and a talent for drawing. As a young boy, he built a canoe and then a garden tractor. His engineering creativity led him to build 3-point blades, bumpers, and eventually stock racks, and thus, Winkel Mfg. was born in 1958. Paul took great pride in the products that bore his name. 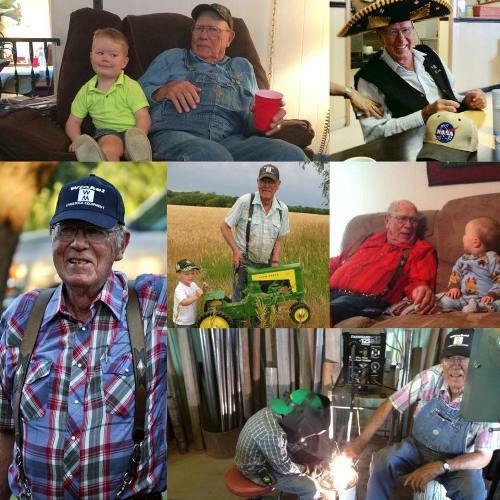 He coined the phrase, “You can take a piece of junk and turn it into something good, but don’t take something good and turn it into junk!” He spent many hours restoring pedal tractors and antique tractors to their original condition and enjoyed participating in the “Tractor Cruise” each year. His greatest joy was in having his sons and then his grandsons join him in the operation of Winkel Mfg. In 2016, Paul was honored by the Kansas State Fair for 50 consecutive years of exhibiting his products. Paul was a member of SS. Peter and Paul Catholic Church and was a past member of the Glen Elder Lions Club, the Limestone Saddle Club, 4H, and the Western Kansas Manufacturers Association. He was preceded in death by his parents and his 7 older brothers: Harold, Ralph, Kenneth, Francis, Wayne, Dale, and Cecil Winkel. He is survived by his loving wife Dorothy with whom he shared 62 years of marriage, along with his 5 children: Roy and Jody Winkel, Glen Elder; Linda Piersch, Lawrence; Joan and Mike Dryden, Manhattan; Alan and Deanne Winkel, Glen Elder; and Beth and Tom Ford, Gillette Wyoming; 11 grandchildren: Jesse (Dee) Winkel, Megan (Parron) Wilcoxson, Amber (Ian) Quayle, Joshua Wendell, Mariah Wendell, Shawn Dryden, Sarah (Travis) Marts, James (Danielle) Winkel, Ann Winkel, Katy Winkel, and Tanner Finney; three step-grandchildren: Tom, John, and McCorra Ford; and 7 great-grandchildren: Byntlee Winkel, Cooper Duskie, Parker Wilcoxson, Addison and Oliver Quayle, Harper and Carson Dryden. ‘til the sun goes down. And his shop full of machines. And meals fit for a king. He’s tryin’ to re-invent the wheel. To keep in your cows. He’s right at the top.